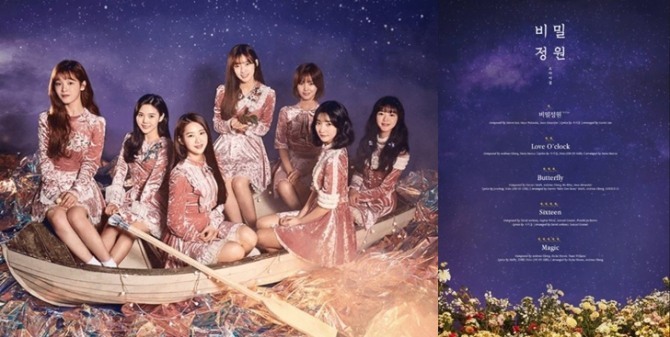 K-pop girl group Oh My Girl unveiled the track list for its fifth album “Secret Garden,” taking on a starry concept on Thursday at midnight. Consisting of five tracks, the lead track “Secret Garden” depicts young girls fulfilling their dreams inside a secret garden. It was composed by Steven Lee, Mayu Wakisaki and Sean Alexander and lyrics written by Seo Ji-eum. With a rhythmical rock tune in the background, the bandmates showcased an unprecedented style in music. Oh My Girl reportedly surprised fans with its new transformation into fairy-like characters. The group’s fifth mini album “Secret Garden” is slated for release on Jan. 9 at 6 p.m.